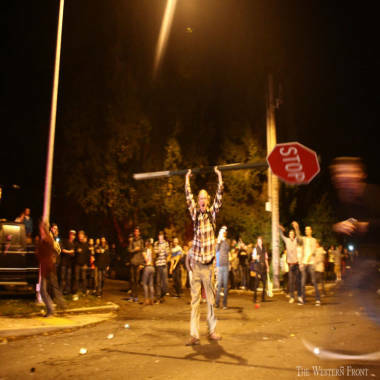 Almost as soon as police in Bellingham, Wash., had finished dispersing a rowdy crowd of young people throwing stones, bottles and even cinder blocks at cops last weekend, investigators sat down at their desks and began surfing the Web. Welcome to policing in the Internet age. As investigators did after the recent beating in New York City of an SUV driver by a pack of angry motorcyclists and the Boston Marathon bombing in April, Bellingham police immediately turned to social media websites to assemble evidence in the melee, which they hope to use to bring key perpetrators to justice. “(We) brought our forensic guy in early Sunday and started pulling it off the Internet, Facebook and Twitter and whatever,” police spokesman Lt. Rick Sucee said of the investigation. That approach doesn’t completely supplant old-fashioned shoe leather investigation, but Grant Fredericks, who helped analyze thousands of hours of video collected by police during an investigation of the 2011 hockey riots in Vancouver, British Columbia, said it can yield vast amounts of evidence if the crime was committed in a place where large numbers of people are present. And getting to that evidence is often just a matter of a few computer clicks. In the Manhattan biker case, for example, video taken by a biker during the Sept. 29 incident and uploaded onto YouTube has become key evidence, as has video taken by a bystander with an iPad. Several people have been arrested in the case, including an undercover officer who had been riding with the pack. He’s allegedly seen in the iPad video bashing the SUV with his helmet. In Boston, an avalanche of video and photos onto social media immediately after the two bombs went off on April 15 provided a mountain of evidence for investigators, who also could look at closed-circuit video from buildings around the scene along with news media reports. One of the first tweets sent out by Boston police after the blast was a request for video from the finish line area. In the Bellingham case, police broke up a large party at an apartment complex on Saturday night, and a crowd of 400 to 500 then gathered at a nearby park and refused orders to disperse. People in the crowd were taking videos and still photos and uploading them straight to social media. YouTube video shows rocks and bottles being hurled at police cars and officers as the crowd screams and chants. Sucee, the Bellingham police spokesman, said several officers suffered minor injuries from thrown objects. At one point, a cinder block smashed a patrol car’s windshield. “If that had gone through the windshield and hit the officer, that would have done some damage,” he said. Three people were arrested at the scene, none of them students at Western Washington University, though the school has promised to punish any student found to have been involved. So who are police looking for now? “We want to look on the videos for felonies, the people who were actually throwing things at police, and try to get as many of those as possible,” said Sucee. A man holds a stop sign on Saturday night in Bellingham, Wash. The Western Front website said video shows the man picking up the stop sign and hoisting it above his head after another person ripped the sign from its post. Including that man brandishing the stop sign over his head? He said several more people have been identified using video and still images and are being sought. He said that if video analysis fails to identify other suspects, the police will release images and ask for the public’s help in identifying them. But investigators are not only looking for suspects, he said. Some of the videos from Bellingham show people watching the confrontation, he noted, useful for police as they seek witnesses. All of that video is uploaded into a computer program – the Bellingham department uses an Avid system – and is then tagged and matched by time stamp and location information, often provided by cell phones, Fredericks said. That gives police a fuller picture of events and people’s movements during and after the incident, said Fredericks, who teaches a class in video forensics at the FBI Academy in Quantico, Va.
“The thesis of that class is that the most prolific source of evidence for police is from video. More than fingerprints or DNA, it’s video,” he said. Can video evidence replace interviews with witnesses? There’s a place for both, said video forensics analyst Gregg Stutchman of Napa, Calif. “Usually they’re from a different perspective, different vantage points, so they’re complementing each other, they’re supplementing each other,” he said. Still, Sucee said having even more video last weekend would have helped officers in Bellingham – his department is just beginning to experiment with tiny lapel cameras that police will wear on their uniforms. “Holy cow, if we’d only had them Saturday night that would have been a big advantage for us,” he said. An image posted on Instagram shows an unidentified woman during the confrontation in Bellingham, Wash., last weekend.